This is Roland Perry’s eighth book on cricket, and for my money his best. Where in his past biographies on great cricketers, Perry has been content to deal with mainly on field happenings. In this publication he has delved deep into his subjects personal life. The result is not just a great cricketing book, but also a complete portrait of a fascinating life. Roland Perry has now written biographies on some of Australia’s greatest players including, Sir Donald Bradman (The Don) Shane Warne (Bold Warnie) and Steve Waugh (Waugh’s Way) Bradman was still alive, and Warne and Waugh were still actively playing at the time Perry released their biographies. Whether because of those reasons or not, I always felt Perry was overly protective with his subjects off field misdemeanours, especially with Warne. Perhaps with Miller no longer being with us, he felt no compulsion to consider his subjects reputation, the result is simply a good read. Roland Perry was able to interview Keith Miller’s four sons, and almost everyone else of interest, from contemporary players to those who served with Miller during World War II. As well as being given access to Keith Miller’s private possessions, this wealth of information is presented in a most accessible and sensitive manner by Perry, and actually brought a tear to my eye while reading about the final days of Miller’s life. 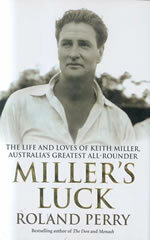 The title of the book, ‘Miller’s Luck’, is a reference to Keith Miller’s luck during the war, in which during at least four occasions Miller cheated death. On a number of these ‘lucky escapes’, war comrades of Miller’s were killed. This gave him a form of post-traumatic stress, in which he had difficulty reconciling why he survived while other young men died. Keith Miller never forgot those he served with, and on many subsequent visits overseas he would seek out the graves of these fallen friends and pay his respects. Perry is not afraid to point out the shortcomings of his subject, including his womanising, hedonism lifestyle and gambling addition. Keith Miller was always a ‘lady killer’ and had numerous affairs, especially during his frequent trips to England. Perry suggests, but does not state that Miller had an affair with princess Margaret. Miller could claim as friend’s people such as: Sir Robert Menzies, John Major, John Howard, Sir Paul Getty and Lord Louis Mountbatten just to name a few. He also carried around three letters in his glovebox from different NSW police commissioners, asking that Miller be treated lightly if he should have any trouble with the law. Keith Miller probably lived one of the most fascinating and exciting lives of just about any cricketer except for perhaps CB Fry. The mind boggles at just how much money Miller would command in sponsorship deals in todays market; A fighter pilot war hero, a big hitting batsman, fast bowler, movie star good looks, and an ability to mix with everyone from garbage collectors to royalty, you image Miller would have been a marketing dream. Roland Perry had this to say about him; ‘Australia has never produced a better all-round sportsman. He was a once-in-a-generation cricketer. More than that, Keith Ross Miller was a once-in-a-lifetime character’.